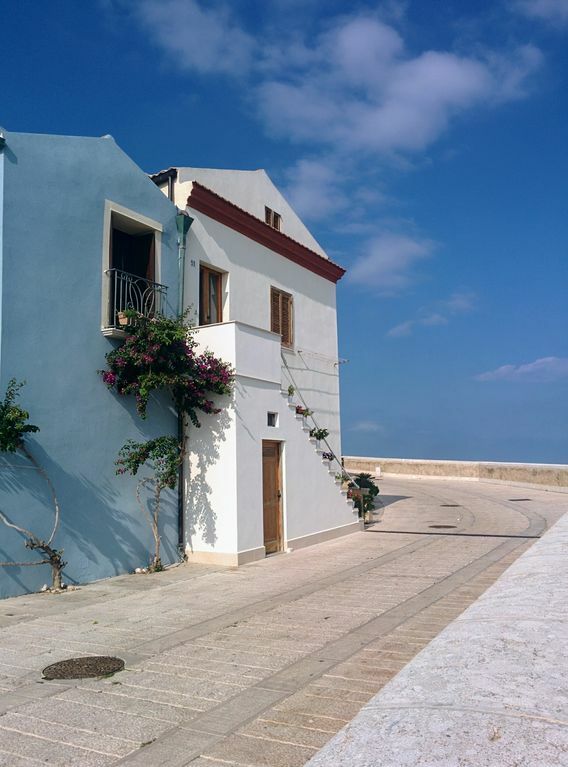 The house is situated in the old town (pedestrian zone), overlooking the sea. View to the Tremiti islands (multi connections daily), port (commercial and tourism) and Gargano. Sandy beaches to the north of 9 Km.a 5 minutes on foot to the South with sailing club, a 15 minute walk. If you do not like view down and feel like you were on the deck of a ship, enjoy all the colors of the sky, see the seagulls flying, have no limits on the horizon .... this house is not for you! The Old Village'' and "Magic" at all hours of the day! We stayed in the property from 22 - 29 April 2017. The rooms have fantastic views over the sea and harbour. Situated in the historical centre of Termoli, this is probably the best area of Termoli to stay for a holiday. At night we watched the fishing fleet leave and return in the morning. The apartment is clean and comfortable, everything is supplied for a self catering holiday. Patrizia and Enzo were very welcoming and helpful when we had queries . We would definatley recommend this apartment for a quiet cosy stay in Termoli, it is a short walk from a fantastic beach with safe bathing and another short walk takes you into the town centre where all your shopping needs can be met. Termoli has many excellent restaurants. Termoli has a lovely promenade where the locals stroll in the evenings . It would be difficult to find a problem with this accommodation. Thank you so much for your appreciation. You have been very welcome and exquisite guests! We look forward to re-entering our house again! Nice designed, well-equipped and clean appartment with vista mare! Greetings for friendly owners - Patrizia and Enzo. Highly reccomended especially for those who appreciate peacefull local atmosphere of beautiful Termoli. siete stati ospiti graditissimi!! Speriamo di riavervi a Termoli!! Charming and well-equipped apartment in the borgo vecchio, overlooking the harbor where the fishing fleet comes and goes regularly. Keep the windows open at night so when the sun rises outside your window you will hear the birds in their morning activities. A few steps out the door you can observe trabucchi engage in an age-old fishing technique. From that point you are also looking at the beach with the snow-capped Majella mountains in the background. Enzo and Patrizia are gracious hosts. Enzo gave us a tour of the town, introducing us to local shop owners with his excellent recommendations. The food was great! Convenient free parking for day trips to the countryside. Highly recommend. An apartment with all the facilities listed and plenty of room for us (a couple). Great view of the port. The main bedroom is on a mezzanine steep narrow stairs from living area. Convenient location with everything within walking distance. 400m to commercial area with restaurants and shops. Free parking less than 200m away. Polite and helpful hosts. Recommended. Molte grazie. Cerchiamo di rendere il soggiorno più piacevole possibile.! "Lovely clean apartment and wonderful view and surroundings"
Our living here was comfortable and quiet. Termoli is a very nice and peaceful place. Also we were lucky to visit some beautiful Italian cities, such as Rome, Sorrento, Alberobello, and to walk in Gargano and Matese Parks and on Tremiti island. We appreciate that the hosts really tried to make their house cosy for habitants! Wide choice of good restaurants with regional cuisine and seafood products from Molise. Excursions to the Tremiti Islands, Gargano (Foresta Umbra, San Giovanni Rotondo ...) and internal Molise (Agnone, Capracotta, Staffoli ...). "August termolese" rich in folklore and cultural events. Feast of the Patron Saint Basso with a procession to the sea.